When the weather starts to warm up and there’s little or no chance of snowstorms, it’s springtime and people start to think about good ol’ spring cleaning. During the months of April and May it’s a good time to go outside and walk around your house, surveying how the place fared during the past winter. Some winters can be harsh, while others can be mild. Over time, though, our area’s weather can really ravage otherwise nice and pristine homes. Pennsylvania winters bring with them snow, ice, sleet and freezing rain, as well as wind. When’s the last time you took a close look at your siding on the house? This spring, check your home’s siding and see if there are any warped or rotted boards. If they are pliable or soft, that could be a sign they need replacing. Do you notice any chipped paint? If the walls have been painted within the past five years but the paint is chipped, peeled or cracking, that’s a sign you need new siding. Over time, siding can fade. Have you seen discolored boards? 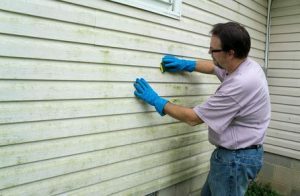 What about mold, mildew or fungus growing on your walls? Look for cracks and/or loose materials. Storms definitely have a way of destroying siding, and when that happens, it’s best to get it fixed or replaced sooner than later in order to avoid more problems down the road. Obviously, you want your siding to do its job. If it’s not keeping moisture out of the interior of your home, you’ll notice loose wallpaper and/or peeling paint on your interior walls. By the way– if you notice bubbles on the boards on the exterior of your house, that could indicate there’s trapped water inside the frame of your place. Anytime you have holes in your siding, that’s a perfect invitation for bugs to crawl in and make their home. Do you want an insect infestation? No, you don’t. As the flowers pop out of the ground and the weather warms up, springtime is the right time for Roofing By Bruce of East Stroudsburg, PA, to do siding repairs or replacement. Please contact us at 570-424-8891 or email info@brucescentral.com for more information.